Differentiate heart failure due to systolic and diastolic dysfunction. Assess prognosis based upon NYHA class and Ejection Fraction. Apply the evidence-based approach to current pharmacological and advanced device therapy treatment guidelines. Understand the assessment of bleeding and thromboembolic risk for atrial fibrillation. Assess patient candidacy for warfarin and novel oral anticoagulant therapies. Incorporation of cardiac imaging tests in the ED evaluation of chest pain. Acute coronary syndromes are a medical emergency; the acute care practitioner must be capable of recognizing, diagnosing, beginning initial therapy, and initiate the multidisciplinary team approach to this life-threating emergency. The use of cardiac biomarkers in acute diagnosis. The early initiation of medical therapy, and when to initiate interventional therapy. Management of Symptomatic Stable CAD: Updated Guidelines for the Primary Care and Acute Care Provider. Appreciate in which patients are percutaneous coronary intervention and surgical revascularization are useful. Review novel medical therapies for stable CAD. Endocarditis: Who are you going to call-Cardiology, Infectious Disease or Cardiac Surgery? Review of clinical criteria for diagnosis of endocarditis. Appreciate the indications for surgical and medical therapy for endocarditis. Review the evidence to support the use of statins for primary and secondary prevention. Review the evidence to support the elimination of non-statin therapy from lipid treatment guidelines. Understand the role of PCSK9 inhibitor therapy and other emerging therapies in management of dyslipidemia. Seattle, Washington (Embark and Debark) – The Emerald City of the Pacific Northwest, Seattle is one of America’s most vibrant cities. Stroll its bustling waterfront (including Pike Place Market), visit the Space Needle, and find a great coffee-shop to enjoy in this coffee-loving city (the home of Starbucks). One of America’s tech centers (Amazon and Microsoft are both headquartered here), the city is abuzz with the interesting people attracted to the opportunities to be found there. There is more than enough to see and do here to keep you busy for a day or two. If you have a little extra time, Seattle is a great place to visit. 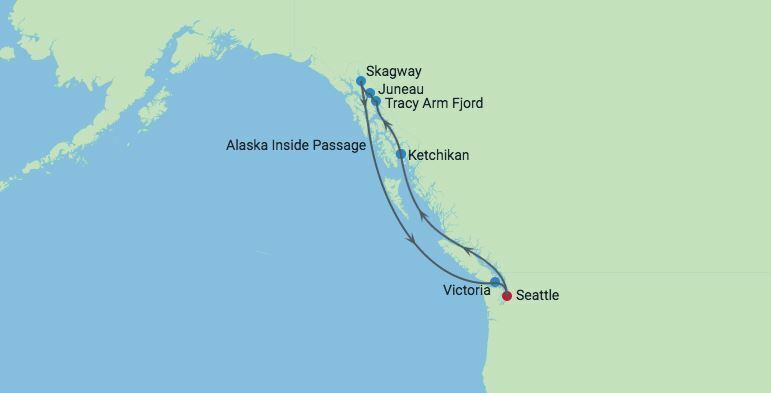 Inside Passage – This is one of the most famously beautiful passages in all the world. It features virtually everything you came to Alaska hoping to see, including rain forests, glaciers, fjords and white-capped peaks. All of which create a setting that’s perfect for viewing whales and sea lions. Juneau, Alaska – In Alaska’s capital, you can pan for gold at Gold Creek and taste salmon baked on an alderwood fire, mush sleddogs, flightsee the Juneau Ice Field, and walk right up to the Mendenhall Glacier at the park. This charming small city also hosts an excellent zipline course. And for the less adventurous, the Red Dog Saloon is near the dock. Ketchikan, Alaska – Immerse yourself in Tlingit Indian culture as you view the world’s largest collection of totem poles; kayak the colorful waterfront. Skagway, Alaska – A frontier town perfectly preserved as the Klondike Gold Rush National Historic Park. Gateway to the Trail of ’98, which you may explore by helicopter or vintage railcar. Tracy Arm Fjord, Alaska – Amidst the pure silence, you’ll sail past translucent blue icebergs silhouetted against a most dramatic backdrop of waterfall-laced rock walls ascending thousands of feet into the sky. This classic fjord, Tracy Arm extends over 30 miles and once seen, it is never to be forgotten. Victoria, British Columbia – Stroll through the charming downtown of this very British city, with its double-decker buses, turreted castles, fine British woolens, tea and china. Or, just outside the city, visit the lush flora and fauna of Butchart Gardens. Organizer Name: Continuing Education, Inc. Continuing Education Inc. is committed to developing and presenting high quality, live lecture accredited continuing education programs for professionals. Our programs cover a wide range of disciplines including Medicine, Dentistry, Law, Insurance and others. Our programs are designed for the specific purpose of allowing the busy professional to obtain the educational course credits required to maintain licensure, while at the same time enjoying a family holiday without spending too much time away from his or her practice. Each participant will receive a Certificate of Completion for the appropriate category 1 CME credits. But most importantly, you will receive a top notch educational experience and an opportunity to relax, renew and reconnect, an experience available exclusively with Continuing Education Inc. We provide the relevant continuing education you need and place it on an extraordinary "campus" that delivers extraordinary value. Join us!